We use drain pipe augering and video inspection equipment to see the interior conditions of your property drain pipes and determine the proper course of action. Your home is an important investment. To protect that investment from water damage a properly installed drainage system is essential. Let our experience in diverting roof-run off and ground water from around homes benefit your property and keep water from getting under your home. CLA Construction goes above and beyond the competitors, with superior workmanship, materials and years of professional experience. We stand behind and warranty our work and offer seasonal maintenance. We use heavy duty SDR 35 PVC pipe, not thinner-walled drain pipe. We double-wrap our drain pipe and line our trenches with commercial-grade geo-fabric, not thin landscape matting, for superior protection. 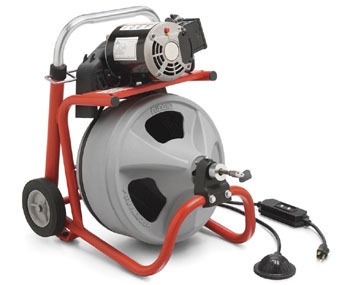 We professionally install sump pumps with included 3 and 5 year warranties. We take extra care around existing landscaping, tree roots, irrigation, plumbing, HVAC & electrical lines. Taking care of your property is our priority! We offer our own patented, custom low-voltage crawlspace ventilation system to actively ventilate and prevent water condensation in your crawlspace. 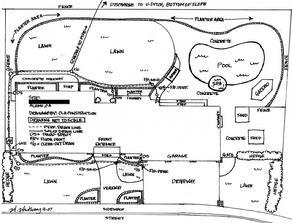 We provide detailed site plans of your new drainage system for your easy reference. Does Your Property Have Drainage Problems? Water can accumulate around and under your home for a number of reasons, including higher sloped neighboring properties, hillsides and retaining walls, lack of landscape slope around the home, natural underground percolation and springs, and the nature of the subsoil itself. 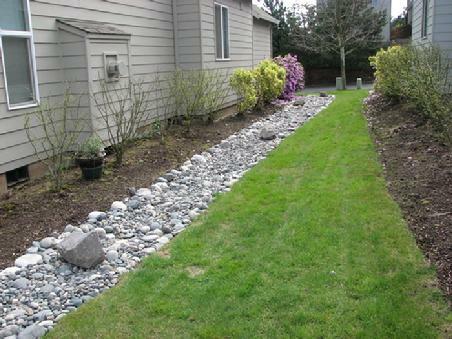 If your property has problems with severe moisture accumulation, then a French Drain is quite often the best solution. Soggy lawns and heavily saturated landscaping can lead to damage of the home’s foundation from the exterior, as well as allow water infiltration into the crawl space area. Increased moisture under your home causes water & rot damage to structural support members and essential systems such as HVAC, plumbing and electrical lines. Saturated soils can lead to shifting foundations. It also provides prime conditions for and for molds and funguses to grow, which leads to health problems. Poor ventilation in the crawl space can exacerbate these conditions. So, what is a French Drain system? Many people assume a French drain system must have been designed by some ingenious French engineers. However, French drains were actually the creation of an American named Henry French (1813-1885), a judge and US Treasury Secretary and author of ‘Farm Drainage’. His practical design relied on lining a gravel-filled trench with clay roof tiles which were spaced apart to allow the percolation and redirection of water. Modern development of perforated drain pipes has surpassed this original technology. A French drain is a drain pipe laid in a sloped trench, which is back-filled with gravel, with the purpose of collecting and redirecting water safely away. The system uses the law of gravity and the fact that water flows downhill by the easiest route possible. Surface and subsurface water run into the spaces between the gravel and into a perforated pipe at the bottom, which allows the water to percolate in and then quickly flow away, discharging well away from the home. It is essential that proper slope is utilized to take advantage of waters natural tendency to flow in the path of least resistance, with deep trenching often required to maintain the right incline. French drains are remarkably effective at relieving hydrostatic pressure in a variety of applications. An external French drain system can be installed around the perimeter of your home, or in specific areas of need, such as behind a retaining wall. A properly installed French drain system can operate for many years, especially when maintained correctly, through periodic flushing via precisely placed clean-out drains. These access points also provide suitable locations to inspect the system with a camera snake, or run a drain pipe augur, in the event of back-ups or clogs. Our systems always include conveniently located clean-outs and flush-points for easy access and maintenance. We also have pipe camera and auguring equipment available on your existing system as well.